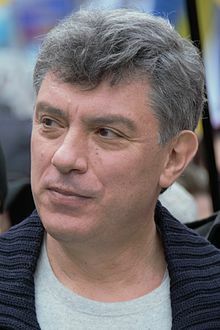 Factio: Solidarnost, Union of Right Forces, People's Freedom Party, Young Russia, People's Freedom Party "For Russia without Lawlessness and Corruption"
Boris Euphemii filius Nemtsov (Russice: Борис Ефимович Немцов, tr. Boris Efimovič Nemcov; natus Sotzii tunc in Unione Sovietica die 9 Octobris 1959; Moscuae die 27 Februarii 2015 necatus), alumnus Universitatis Gorkijensis fuit politicus Russicus et praesidis Vladimiri Putin adversarius. Vicimedia Communia plura habent quae ad Boris Nemtsov spectant. Novissima mutatio die 6 Februarii 2016 hora 11:32 facta.